I sometimes wonder if my love of books could be an addiction of sorts. I can get high just walking into a bookstore. When we downsized from a four bedroom house to a room in this community, books were among the most difficult things for me to let go of – and I did let go of boxes of them. Despite this, books are the major clutter in our room now. I once met a person who claimed to have read ninety per cent of the books she owned. I never imagined such a thing was possible. I don’t think I’ve read more than 50% of the books I own, but that doesn’t stop me from acquiring more. The Kindle app is not my friend when it comes to this. The ability to download books that don’t take up room on the shelf is sometimes too great a temptation to resist. And yet, when I think of the experiences books and reading have led me into, I don’t really want to put a negative label on my love of them. As a shy child in an alcoholic family, trips to the library were pure joy. The only cloud was that I couldn’t check out more books than I could carry. Books let me imagine different worlds than the one in which I lived. I loved stories where people overcame adversity. They gave me hope. I used to save my allowance to buy Landmark books, a series of books about history written for children. History came alive with interesting characters. Even school books could do it sometimes. I can still remember pictures in my fourth grade geography book of piles of cheeses in Holland and of the Alps in Switzerland. I was filled with longing to see them in person – to see as many of the world’s amazing places as I could. That longing has led me all over the world. Since I went to Catholic schools, reading about the saints was a given. Descriptions of tortuous deaths were probably not the best images to put into the brain of someone with such a vivid imagination. But, the stories of people dedicated to making a difference nevertheless inspired me and made a life of service to others and the world look attractive and possible. By high school I was reading widely and not censored by anyone. My aunt caught me reading Catcher in the Rye – then considered very controversial – and confronted my mother about it. My mother, wise woman that she was, told her that I was old enough to decide for myself what I read. I still have my underlined copy of one of the two books that most influenced me in high school – Dag Hammarskjold’s Markings. The other was a book called Religion and Personality by Adrian van Kaam. A priest saw me reading it shortly after it came out and told me I shouldn’t. He said the subject was beyond me. I ignored him. That book crystalized my life-long passion for the connection between the psychological and the spiritual. Tolkien’s Lord of the Rings saved me from dying of boredom when I had mono in college. I discovered Thomas Merton and was particularly influenced by his Faith and Violence. Sometime in college I started to keep a list of the books I read, a list that I unfortunately lost sometime in the last ten years. Having children and grandchildren added more dimensions to reading. I found that C. S. Lewis’s language is even more beautiful when read aloud. I loved Chronicles of Narnia so much that I read the whole series to each of our three children at bedtime. Even some picture books delighted me more than I can express. Examples: Annie and the Wild Animals and The Quilt Maker’s Gift. Children and grandchildren have invited me to read books that I wouldn’t have picked up on my own. The Twilight, Hunger Games and Divergent series came into my life that way. So did Get Me Out: A History of Childbirth from the Garden of Eden to the Sperm Bank and How Eskimos Keep Their Babies Warm and Other Adventures in Parenting. Then there are the books – not many – that I’ve loved so much I’ve read more than once: The River Why, The Lord of the Rings, The Wind in the Door, The Secret Garden, The Stream and the Sapphire, The Chronicles of Narnia. They have either touched my heart or taught me lessons that I can return to for inspiration and direction. What am I reading now? I’m working my way through The Spirituality of Imperfection in preparation for a retreat I’m leading at the end of the month. I’m stalled part way through Frances Fitzgerald’s Fire in the Lake. It’s teaching me fascinating things about Vietnam and giving me new perspectives on the US, but it is slow going. For fun I’m reading a Sherlock Holmes and Mary Russell novel by Laurie King. 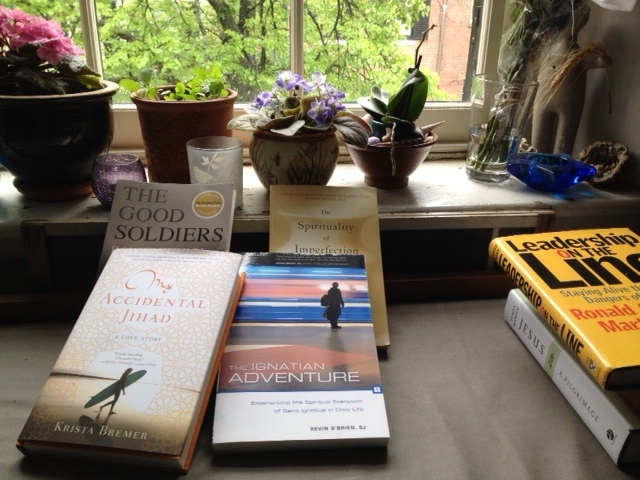 Stacked up next are The Good Soldiers because Bill enjoyed it so much, James Martin’s new book Jesus: A Pilgrimage, and My Accidental Jihad because it was written by a woman who was a junior high school friend of our daughter, Maleita. On the Kindle app are some medieval murder mysteries and Quiet: The Power of Introverts in a World That Can’t Stop Talking. In our quest for a simpler life, perhaps Bill and I will use the library more. We now have library cards for both the Boston Public library and the Cambridge library. We also have a membership in the Athenaeum, one of the oldest independent libraries in the United States. In addition to access to the books, these institutions provide great spaces to read and to write. Still, I imagine that owning books will remain a part of our lives. Given that Bill and I will probably always live in a cluttered space, I prefer that the clutter be life-enriching books. An addiction? Maybe. But one I embrace. What books have influenced you and why? What is your current relationship with books? This entry was posted in Books and reading, Downsizing, Home and tagged Posted by Carol Mitchell. Bookmark the permalink. I love this topic. Books have been the hardest thing to let go of in our downsizing process. I have edited quite a bit, but being an avid reader makes it difficult. I think books that expand our minds, hearts, and imaginations have a place in any home, no matter the size. I will be looking into your Religion and Personality – how interesting. I have a Nook and it is my worst impulse addiction. I just completed the War of Art by Steven Pressfield, excellent book, I started Rediscovering Catholicsm and might need to pick it up again, The Happiness Hypothesis by Jonathan Haidt…and too many more on my book to name! Great topic, Carol. As we prepare to move from South Bend to California we, too, are downsizing, books included. It’s like saying goodbye to old friends. It helps me when I feel like I’m giving the departing books a good home, like Erasmus Books or Better World Books. I use the library much more than I used too. And fortunately, South Bend has a very good library system. Books have opened so many worlds for me. 20,000 Leagues Under the Sea – a favorite as a kid – I read over a dozen times. Tolkien, C.S. Lewis, and others of the Inkling crew I’ve also read and re-read with pleasure. Other books I read to remind myself of things I’m still struggling to learn. How Can I Help? Reflections on Service by Ram Das and Paul Gorman would be an example. For a chronic do-gooder, being self-critical about helping can be very salutary. I still love bookstores and struggle with my acquisitive instincts when inside, but more and more I just note the titles that intrigue me – and then head to the library! 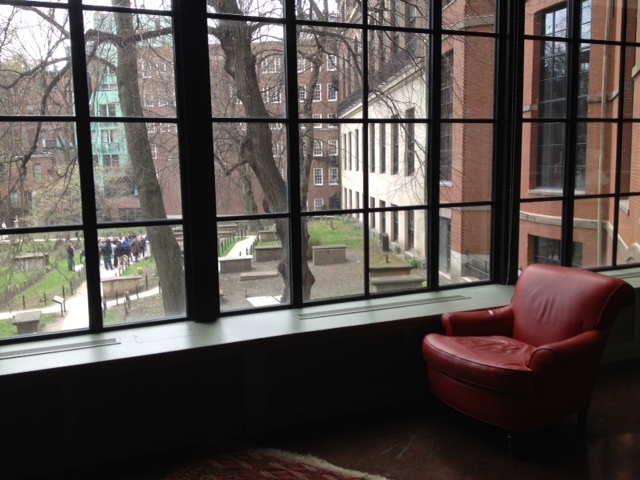 Bill lived at Beacon Hill Friends House in Boston from June 2013 until August 2015. He works occasionally as an affiliate faculty with the Poynter Institute, struggles to become a better photographer and keeps an eye out for what's next. He lives now in Brookline, just up the Green Line from BHFH and across the hall from Leila and Mateo and the couple whose life they direct. 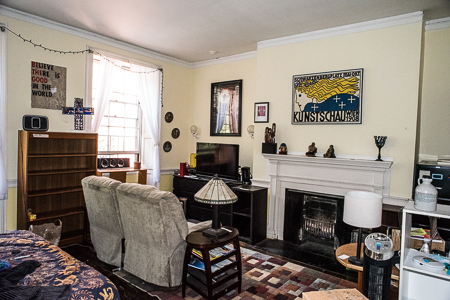 Carol lived at Beacon Hill Friends House, an intentional community in Boston, from June 2013 to August 2015. She now lives in Brookline, MA, across the hall from her favorite teachers, two-year-old Leila and six-month-old Mateo. A former clinical psychologist, she now works as a retreat leader, spiritual guide and consultant. Enter your email address to follow A Year in a Room and receive notifications of new posts by email. The car is gone… on Keep the car? On generosity: How much is enough? Responsibility – to whom about what? Sabbatical, retirement or do we need another word? High-tech kitchen app: Just how fresh is that coffee?